Michael Donéllan, also known as ‘Michael of Carlos Place’, was born in born in Dublin and trained as a surgeon before becoming a couturier. He started his career at Lachasse and opened his salon ‘Michael’ in Carlos Place in 1953. Michael’s sculptural traditional tailoring with a twist, much admired by French couturiers, earned him the reputation for being ‘the Balenciaga of London’. 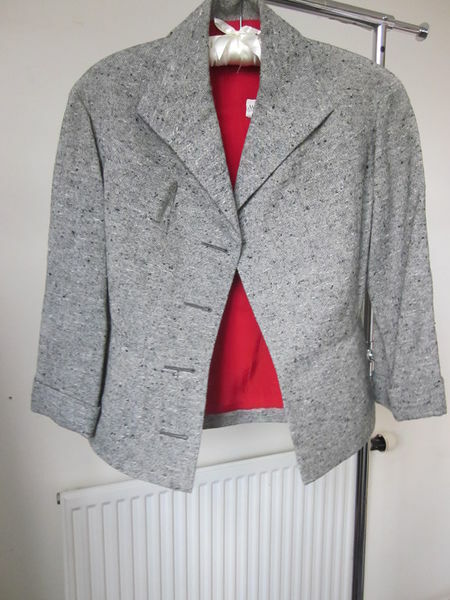 In the 1960s his influence extended to the high street when he became an adviser to Marks & Spencer and worked to improve the cut and cloth used for mass manufactured clothes. This bespoke skirt and jacket ensemble is a good example of Michael Donellan’s sculptural tailoring and shows the influence of Dior’s 'New Look' in the flared hips, sloping shoulders and nipped-in waist of the jacket. 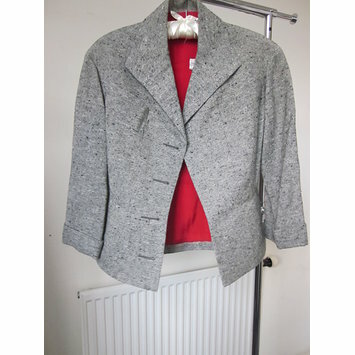 Tailored jacket and skirt of grey slubbed tweed with red silk satin lining, buttons missing.